Brad Keselowski took victory in the 2018 Big Machine Vodka 400 at the Brickyard Powered by Florida Georgia Line. The thrilling 160-lap race resulted in 14 lead changes with 9 different leaders, 10 cautions and a fastest race lap of 185.041 mph. The 2018 Big Machine Vodka 400 at the Brickyard set the field of 16 drivers for the Monster Energy NASCAR Cup Series Playoffs with Kyle Busch being crowned regular-season champion. Brad Keselowski is making a habit of collecting crown jewels and now he has the distinction of giving Roger Penske his first Brickyard 400 victory at Indianapolis Motor Speedway in the Monster Energy NASCAR Cup Series. Coming on the heels of his win at Darlington Raceway in the Bojangles’ Southern 500, Keselowski battled Denny Hamlin on a restart with three laps to go, using fresher tires and a little bit of his bumper to make the crucial pass en route to winning at the famed 2.5-mile track. Erik Jones came home second in the Joe Gibbs Racing No. 20 Toyota, with Hamlin, Kevin Harvick and Clint Bowyer rounding out the top five. For Keselowski, it was his 26th victory in the Monster Energy Series, and it came in the regular-season finale as the NASCAR Playoffs field of 16 drivers was set. Hendrick Motorsports teammates Jimmie Johnson and Alex Bowman took the final two playoff spots that were available. Kyle Busch, who finished eighth, clinched the Regular Season Championship and will carry the 15 bonus points for that into the NASCAR Playoffs. Busch has a total of 50 bonus points entering the playoffs, thanks also to his six wins and five stage victories this season. Meanwhile, defending series champion Martin Truex Jr. blew a left-front brake rotor in the No. 78 Furniture Row Racing Toyota on Lap 40, exiting the race with extensive hood damage and finishing 40th. 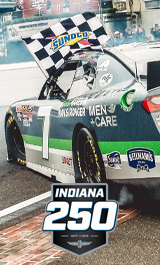 Fans can renew their tickets now for the 2019 Big Machine Vodka 400 at the Brickyard and Lilly Diabetes 250 by visiting IMS.com/Renew. Once again, the field of 16 drivers for the NASCAR Cup Series Playoffs will be set at the Indianapolis Motor Speedway Sept. 6-8, 2019.